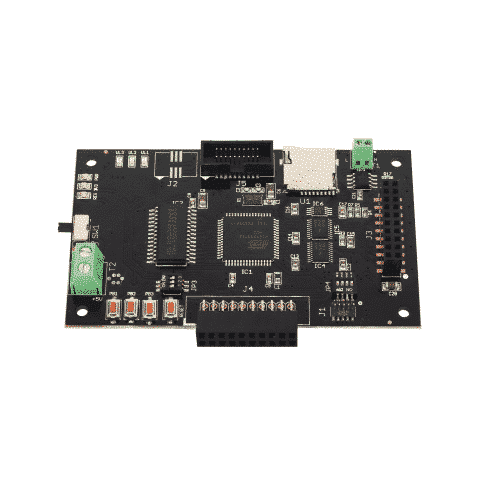 The Crux is a development board ideal for embedded system programming. The board is powered by Harvard architecture RISC controller (AT90CAN128); which provides a maximum throughput of 16MIPS and 128K flash programming memory, hence making the board suitable for any embedded system application. Crux allows users to build various applications by interfacing external devices/sensors, using open aux and expansion ports. Crux has various communication lines (UART, SPI, CAN, and I2C) enabling multi-board communication capability. Additionally, Crux also has an external Real Time Clock (DS1307) interfaced using I2C. It is also equipped with a CAN transceiver for the on-chip CAN controller. Crux supports an on-board line driver (Bidirectional Voltage Translator) making it easy to interface with peripherals operating at 3.3V. Considering the low on-chip RAM (4KB), Crux has a 32KB external CMOS SRAM. Crux has Phi Robotics Expansion Bus. Phi Robotics Expansion Bus is a cross-platform stackable connector which allows user to build modular systems. Multiple expansion boards can be stacked on top of a base board to expand the system functionality. All the signals on the expansion bus are standardised to 3.3V. Base board expansion bus have 3.3.V and 5V supply lines to power expansion boards. All Phi Robotics base boards and expansion boards comply with this expansion bus design.